Over the next several weeks, I’m beginning a series of posts looking at some of the operations of the former Algoma Central railway, with each post focusing on some particular commodity and/or facet of the operation. Generally speaking, the posts will roughly cover historical and current operational information from about the 1970s to today. As this series progresses, if anyone reading has further information that expands, illumines, adds to, corrects my information, or even flat out contradicts an assumption I’ve made, please do comment on the post or send me an email! I’d love to be able to flesh out any gaps or errors in my knowledge. As a preliminary overview, one should understand the geography of the area, and how the ACR fits in to the other railways in the region. This map shows the railways in Northern Ontario in the mid 1980s. The Algoma Central is the black line running vertically in the centre of the map. 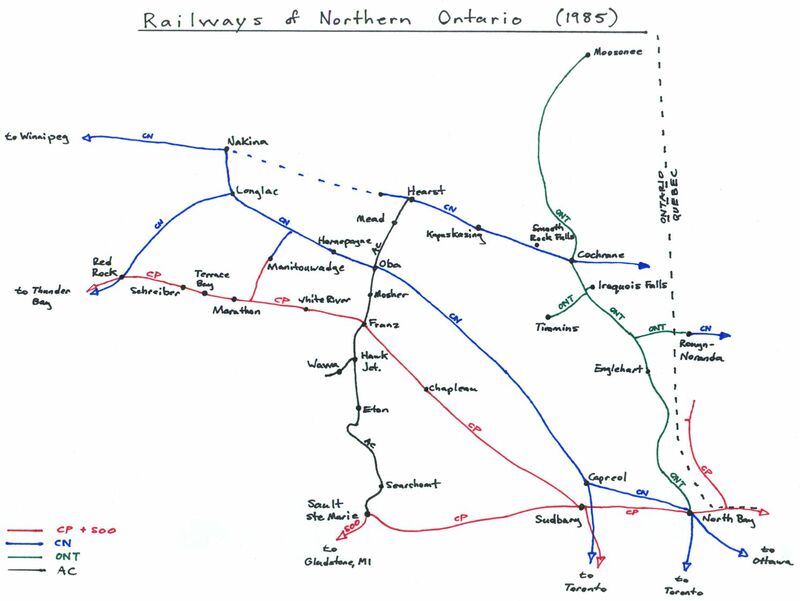 Important interchanges for traffic exchanged with other railways are located at Franz (Canadian Pacific), Oba (Canadian National), Hearst (CN and by extension Ontario Northland) and Sault Ste. Marie (SOO and CP). All of these points are extremely important for traffic coming onto or off of the ACR. This entry was posted in Operations and tagged Operations, Prototype by Chris van der Heide. Bookmark the permalink. Looking forward to the information flow. I’ll dig through my archives of questions and details to crosscheck and amplify your posts. Sounds good Blair. I welcome anyone with either additional information or corrections to add those to the discussion. THANKS & SEASONS GREETINGS….Is there a yahoo SIG for the Algoma??? I’ve added that to the links in the side panel on the main page of the site.